When it comes to snacks and confections, the watchwords for the 21st century have been a return to simplicity, health, and transparency about labeling. Today's RxBar Coconut Chocolate protein bar (distributed by Chicago Bar Company LLC, Chicago, IL) is a great example of a bar you might not have seen very often in the 1990s. 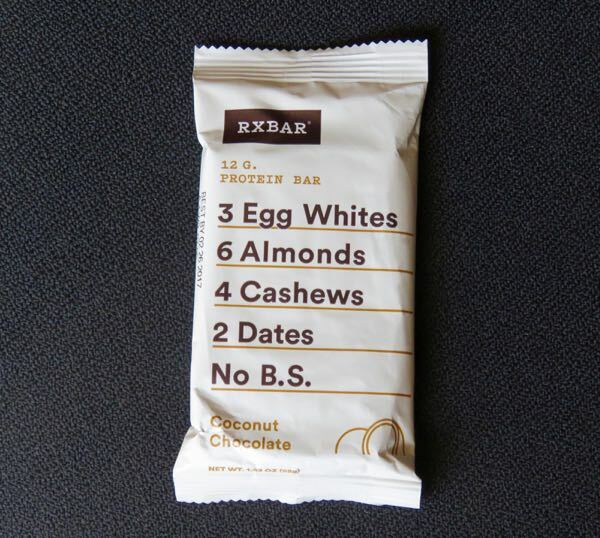 The relatively short ingredients list for the bar base read like a manifesto and received headline treatment on the wrapper: "3 Egg Whites, 6 Almonds, 4 Cashews, 2 Dates, No B.S."... "No Gluten, No Soy, No Dairy, No Added Sugar," it continued. 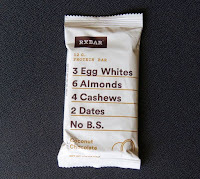 Today's bar also included cacao, coconut and sea salt. 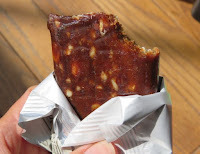 This bar was a well balanced blend of subtle fruit, nut, cacao and coconut flavors; and it was chewy, substantial and delightfully un-sweet.